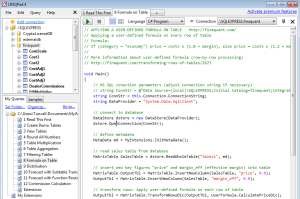 Download installation file and user manual of finaquant® protos, the Table Function library.1. This free (zero-priced) .NET library can only be used for non-commercial purposes like education and science2. See installation and getting started. NOTE: Allowed table size is limited (max 20’000 rows) in the published standard release of finaquant® protos. See commercial finaquant® calcs or contact us if you need unlimited table size. All table operations and calculations with in-memory data, just like matrices! Standard methods can be extended with user-defined table functions (like user-defined formulas in excel). 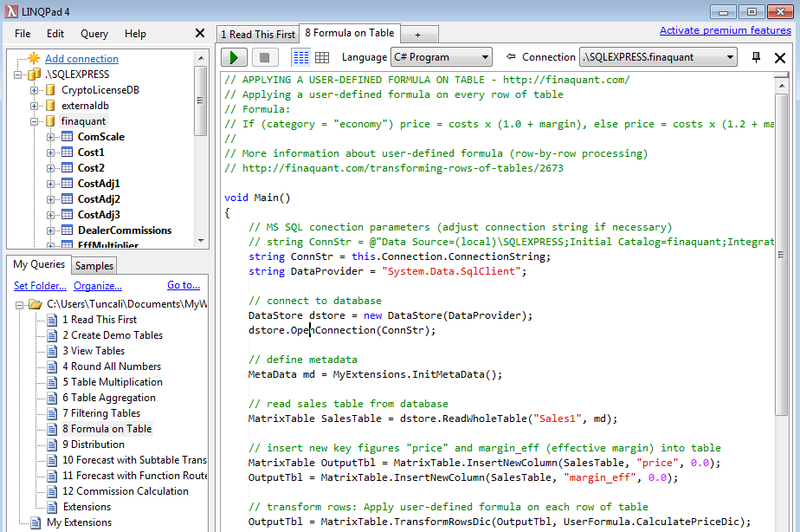 Table Functions can replace database programming for analytical operations on data tables. Table Functions can be compared to Matrix Functions of math software like Matlab or R, with the difference that their input & output parameters are data tables instead of matrices. Library includes methods to store multiple arrays of data tables in a relational database like MS SQL or MySQL. Tables can also be stored as XML files. Download Visual Studio project FinaquantProtosStarter which is the best training tool for Getting Started with Table Functions. You may find in it a demo function for every group of Table Function. Open and Save a new Visual Studio project. From the Tools menu, select Library Package Manager, then click Package Manager Console. That’s it; the latest release of finaquant® protos will be downloaded and referenced to your Visual Studio project automatically. Note: You may need to add System.Windows.Forms to project’s assembly references. You can install the popular development tool LINQPad and begin to test demo scripts with finaquant’s table-valued functions (in C# or VB.NET) within minutes. See required steps..
You can easily build a web service based on the Web API framework to utilize the power of table-valued functions. Downloads and explanations here..
PersistentTableArray Enables operations with persistent array of tables of type MatrixTable. Note: You may download Class Library Document for Finaquant Protos	(685 downloads) for a complete list of classes, methods and properties. Table functions and table mathematics. Some table functions like Allocations & Distributions and FOX formulas are embedded in expensive business software like SAP that are used for accounting, financial planning and reporting. These are but only a subset of the table functions that are available in finaquant® protos. Read: Why finaquant® protos? Listen: Why Table Functions? Don’t hesitate to contact us for any questions or inquiries. See help page for technical user information about Table Functions and Calculation Nodes & Networks.